A complete replacement set for the Walthers kit's platforms, railing, ladders, and other small details. All platforms feature perforated brass grilles for an airy see-through look. All handrails are fine scale, fold-to-shape brass parts than can be glued or soldered to the platforms. Replacement vertical ladders are also fine scale thickness brass. All parts bear the same part numbers as the Walthers parts which they are intended to replace on a one-for-basis with precise fit. This permits the use of the Walthers kit instructions for correct placement. 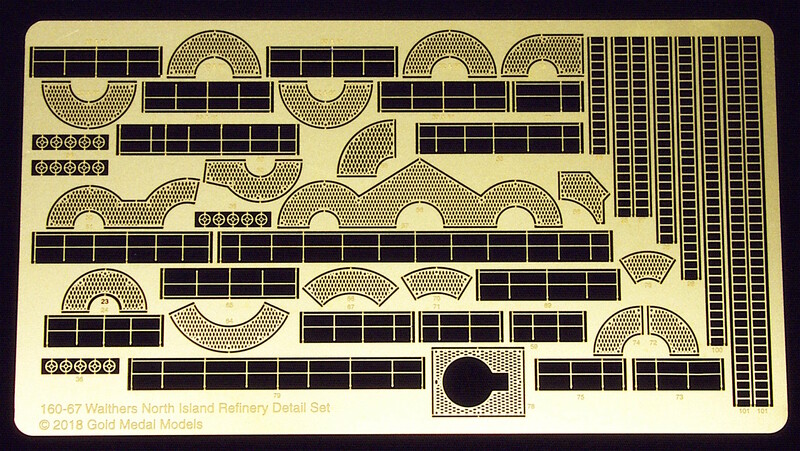 Installation of these parts will transform the refinery kit into a superb front-of-the-layout masterpiece. Modern-era modelers can substitute the Gold Medal Models No. 160-38 Safety Cage Ladders (sold separately) for the standard vertical ladders. Etched in .013" brass.